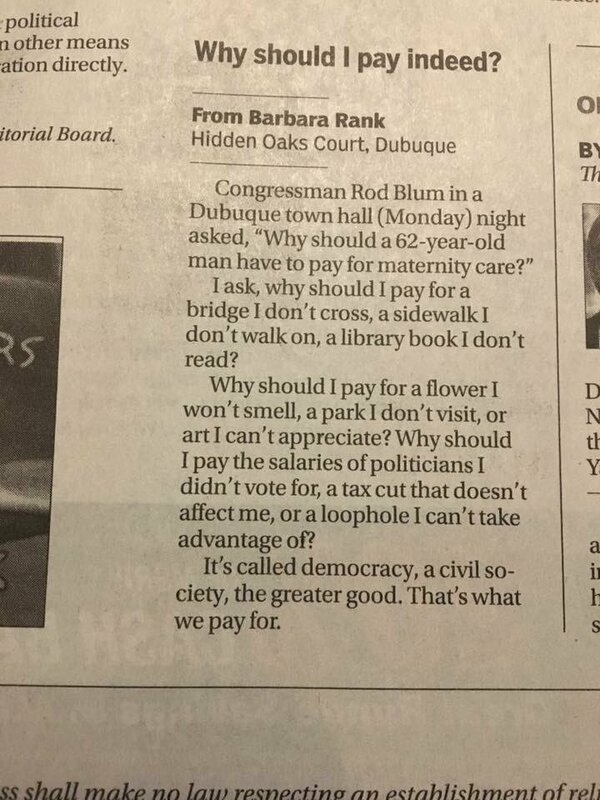 A screen shot of Barbara Rank's viral letter to the editor (IMGUR). Barbara Rank, 63, was present during the town hall. The next day, she decided to send a letter to her local newspaper responding to Blum’s comment. “Congressman Rod Blum in a Dubuque town hall (Monday) night asked, ‘Why should a 62-year-old man have to pay for maternity care?’” Rank wrote. “I ask, why should I pay for a bridge I don’t cross, a sidewalk I don’t walk on, a library book I don’t read? “Why should I pay for a flower I won’t smell, a park I don’t visit, or art I can’t appreciate? Why should I pay the salaries of politicians I didn’t vote for, a tax cut that doesn’t affect me, or a loophole I can’t take advantage of? Rank also noted that the letter was inspired by the little landmarks of her life: the bridge and flowers that she passes by on her daily walks, a neighboring town where residents did not want to pay for sidewalk maintenance, an art piece that did not particularly strike her favor when she was in college.